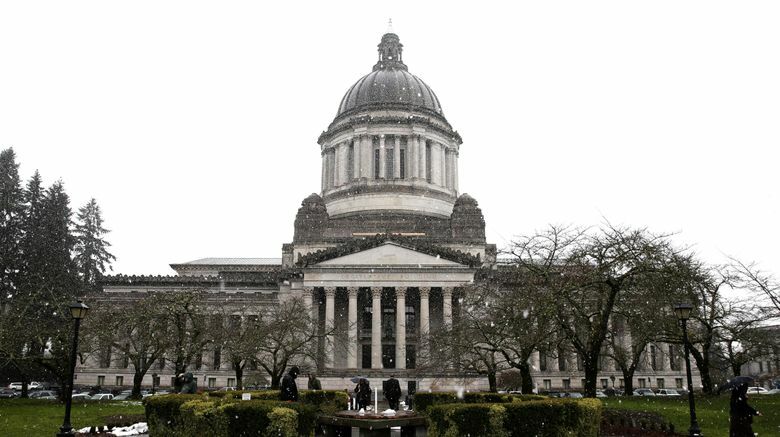 The long-raging fight between the right-leaning Freedom Foundation and Washington’s labor unions erupted on the state Senate floor over a bill to change the state contracting process. OLYMPIA — Like all high drama on the Washington Senate floor, the midnight dust-up on a bill to change a state-contracting process comes with a rich backstory. In this case, the long-raging fight between the right-leaning Freedom Foundation and Washington’s labor unions spilled into the Legislature with a clash over Senate Bill 6199. The bill would restructure the way tens of thousands of home health-care workers are contracted with by the state Department of Social and Health Services (DSHS). Requested by DSHS and supported by Democrats — along with two Republican co-sponsors — the bill could also lead to thousands of workers paying dues to Service Employees International Union 775 (SEIU). That’s because it could allow SEIU to eventually negotiate a contract that removes the provision that lets home health-care workers opt out of paying union dues. That opt-out provision came from a 2014 U. S. Supreme Court decision known as Harris vs. Quinn. After that ruling, the Freedom Foundation sued SEIU 775 to get contact information from its workers in order to tell them they don’t have to pay dues. In response, the union sponsored a successful ballot measure last year making some information about those employees exempt from Washington’s public-records law. Wednesday night, when Democrats brought SB 6199 to the Senate floor, Republican senators loudly decried the bill. Lawmakers debated it into Thursday morning, but it didn’t ultimately get a floor vote. “This bill has gotten caught up in the larger Freedom Foundation-SEIU fight,” said Sen. Mark Miloscia, R-Federal Way and one of two GOP co-sponsors. “Ultimately, at the end of the day, our state has got to sort of decide how valuable you think are unions,” added Miloscia. Miloscia said he still supports the proposal, though he said he doesn’t believe it is perfect. Some of his colleagues, along with the Freedom Foundation, took a harsher view. It makes sense to improve how DSHS handles contracts with home health-care workers, Fain added, but Democrats had been unwilling to compromise. Democratic Senate Majority Leader Sharon Nelson of Maury Island said she didn’t bring the bill to the Senate floor with the expectation of actually passing it late at night. Nelson said she believed it would take time to get the bill worked out and wanted to start that process. She disputed the notion that Democrats didn’t compromise. “You’ll notice we took one of their (GOP) amendments last night because we agree with them,” Nelson said. In the bill, “There are benefits to people who need care, to people who provide the care, to the state, who has to manage that,” Postman said. SB 6199 aims to simplify a contracting process that has become complex over the years with state and federal laws surrounding overtime and minimum wage, according to Bill Moss, assistant secretary of DSHS’ Aging and Long-Term Support Administration. The agency currently holds individual contracts with each home-care provider, Moss said. The situation means DSHS case workers spend unnecessary time working on the contracts and financial issues rather than quality of care, he said. This proposal would create a program to allow DSHS to contract the whole service to a private company, which would then be the workers’ legal employer. That private company would then eventually negotiate a contract with SEIU 775, Moss said. DSHS drafted the legislation itself, Moss said, but SEIU was one of a group of stakeholders that gave input. Postman said the governor’s office also discussed ideas on the bill with SEIU. A representative of SEIU 775 didn’t respond to questions sent Thursday by a reporter, and referred inquiries to DSHS and other groups with an interest in the bill.